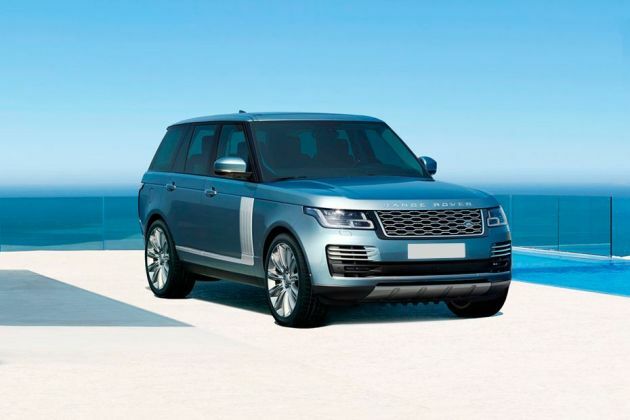 JLR, the fully owned subsidiary of the Tata Motor Group has introduced the long wheelbase version of its premium SUV Land Rover Range Rover. It is available in several trim levels out of which, the Land Rover Range Rover LWB 4.4 SDV8 Autobiography is one of the top end trim and it comes fitted with 4.4-litre diesel engine under the hood. This engine is capable of churning out a peak power of 334.3bhp in combination with a maximum torque of 700Nm, which is impressive. This latest trim gets minor tweaks to its exteriors in the form of a new headlight pattern. However, it received a major update in the form of increase in its wheelbase and length as it now comes with 5199mm of total length and 3120mm overall wheelbase. This has created a additional cabin space inside, especially the leg space is drastically improved. The car maker has retained all its interior and exterior features without any changes. This newly introduced Land Rover Range Rover LWB 4.4 SDV8 Autobiography trim looks identical to its existing variants. However, from the side facet, it looks slightly longer, thanks to its increased length of 5199mm. The manufacturer has made minor tweaks to its exterior cosmetics that distinguishes its exclusiveness. On its front profile, it comes with the same headlight cluster but with modified light pattern that features automatic adaptive xenon headlamps with signature lighting and high beam assist function. The front bumper also gets a minor tweak with a slightly pronounced air intake section and air ducts. Its air ducts hosts LED fog lights , which enhances the visibility ahead while giving a dynamic look to the front profile. Coming to the sides, the company has Santorini black exterior mirror caps to the doors that are further incorporated with LED side blinkers. The wheel arches of this trim have been fitted with a set of 5-split spoke style 20-inch alloy wheels that gives a modernistic look to the side facet. The rear comes with large windscreen accompanied with a roof spoiler along with a high mount third brake light. The tailgate is plain, but is fitted with a wide yet thick chrome strip and embossed with 'Range Rover' lettering. The interiors of this Land Rover Range Rover LWB 4.4 SDV8 Autobiography trim are extremely spacious, thanks to its large wheelbase of 3120mm. The manufacturer has done up the interiors with premium quality material, especially by using leather upholstery, which has given a luxurious finish to the cabin. Its cockpit is fitted with 18-way adjustable driver and front passenger seats, which have been incorporated with a massage function as well. Furthermore, the front seats have been blessed with memory settings, while the rear seats have climate function including four way adjustable settings. The best part about the interiors is its elegantly crafted dashboard with advanced central console, which features numerous advanced equipments like AC unit , infotainment system and numerous other control switches. This trim comes with carpet mats in both the front and rear cabins, which also features contrast edges and metal corners. This sophisticated SUV is powered by a 4.4-litre SDV8 diesel power plant that comes with a displacement capacity of 4367cc . This engine has 8-cylinders, 32-valves and is incorporated with a turbo charging unit. It allows the motor to pump out a peak power output of 334.3bhp at 3500rpm in combination with a maximum torque output of 700Nm in between 1750 to 3000rpm. This engine is paired with a sophisticated 8-speed automatic transmission gearbox that distributes the torque output to all four wheels in the form of AWD layout. It takes only about 6.8 seconds for this vehicle to reach 100 Kmph mark and can reach a top speed in the range of 200 to 218 Kmph, which is remarkable. The car maker is offering this luxury SUV with a sophisticated disc braking mechanism, which is highly reliable. Both the front and rear wheels of this vehicle have been paired with high performance disc brakes along with superior brake calipers for enhanced performance. This mechanism gets further assistance from electronic brake force distribution and electronic brake assist system. On the other hand, it comes with an adaptive air suspension system on both its front and rear axles, which keeps the vehicle stable and agile on all road conditions. In addition to these, the company is also offering 'Terrain Response 2' system , cruise control and several other traction control programs. This Land Rover Range Rover LWB 4.4 SDV8 Autobiography trim is the top end variant in its series and is introduced with highly advanced aspects. Its cabin is equipped with a four zone air conditioning system with fully automatic climate control function, which regulates the air temperature of interiors. The car maker has also incorporated a four spoke multi-functional wood steering wheel that is wrapped in leather and is further incorporated with heating function. It also has innovative aspects like auto-dimming interior mirror, customer configurable interior mood light, illuminated aluminum tread plates with autobiography lettering, and winged headrests. The car maker has also incorporated an advanced 825watt Meridian surround sound system along with rear seat entertainment system that features an 10.2-inch touchscreen display and remote control. Furthermore, it also comes incorporated with a television tuner, Bluetooth phone connectivity and audio streaming. The car maker is also offering optional features like navigation system and rear executive class seating with cooler compartment. The protective aspects offered in this trim are top class, which ensures maximized protection to the vehicle and its occupants as well. This trim comes equipped with dual front airbags along with side, seat-front, thorax and pelvis airbags, which minimizes the damage caused in case of a collision. It also comes with a list of features including hill descent control, dynamic response, electronic brake force distribution system, dynamic stability control, electronic stability program, electronic traction control program and brake assist system . It also has aspects like dynamic stability control, key less entry, volumetric and perimetric alarm with engine immobilizer, which ensures unparalleled protection to the occupants. 1. Innovative comfort and safety aspects are a big plus. 2. Spacious interior cabin with luxurious finish. 1. Fuel economy can be improved. 2. Cost of ownership and maintenance is expensive.